I don’t know how it happened. I woke up this morning and felt fine. I fed the dog, I brushed my teeth, I hopped back in bed with Lucy and MQD and I started to feel freezing cold. Thirty minutes later I was hurling. I crawled back in to bed and let Lucy sidle up to the buffet. She went to town and then the last thing I remember was saying “Can you take her? '” to MQD. I had the Sleep of the Dead for another hour and a half. I woke up a little after ten. I felt like maybe I was going to live after all. I heard no tears from the living room so I ventured out. This is when things stopped making sense. “I thought I’d take Em for a hike,” he said. A hike. We don’t hike. We watch Netflix and ride bikes at the park and make pancakes. And sit around. It was a Sunday, right?? A Sunday. The day of Rest. So, I went and made a cup of coffee. Exactly what you should do when you’ve had a violently upset stomach. “I’ll go with you. Lemme see if I can eat something.” Something like EGG SALAD. We were in an alternate universe where coffee and egg salad was the new ginger ale and saltines and violent upchucking with a splash (and I do mean a splash) of diarrhea was the perfect precursor to to hiking. Oh. And in this parallel universe we hiked. 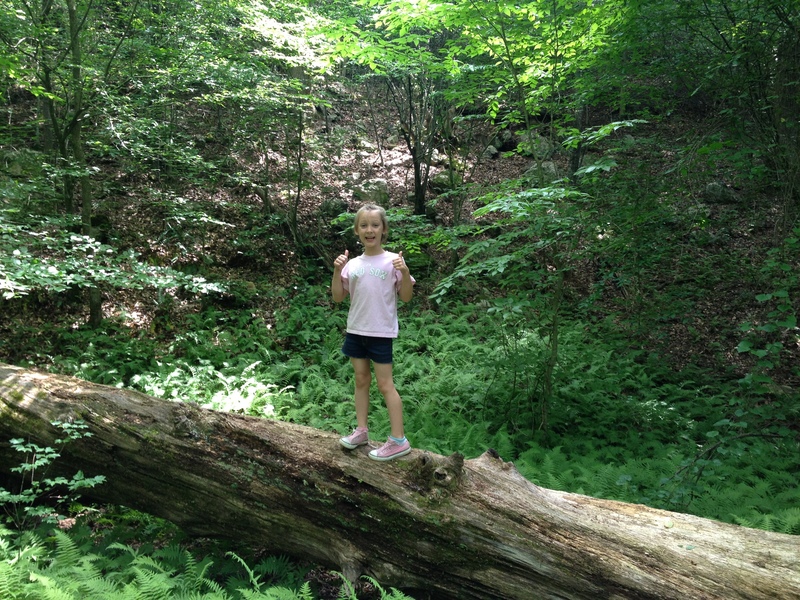 In the beginning Emily was pro hiking. Within the hour we were getting out of the car at the Occoneechee Mountain State Park, a three minute drive from our house. I started to laugh as we headed off in to the woods. “We don’t hike! !” I said. “We do now,” said MQD. 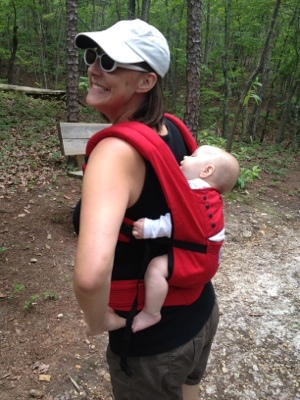 Hiking was win-win at first, Lucy was sleeping in the Ergo. Fish was psyched. Emily was talking non-stop and MQD suggested we do this every weekend. The MapMyRun app in my phone said we had gone almost two miles when I suggested we turn around. Looking at the map we did not appear to be even kind of close to where we parked. How can you expect me to just keep walking??? Nearly four miles and an hour and a half later we were back at the car. And it was fun. We hiked. We might do it again. We might be a family that hikes. I can not explain the depths to which this is hilarious to me. Here is a picture from last Sunday. 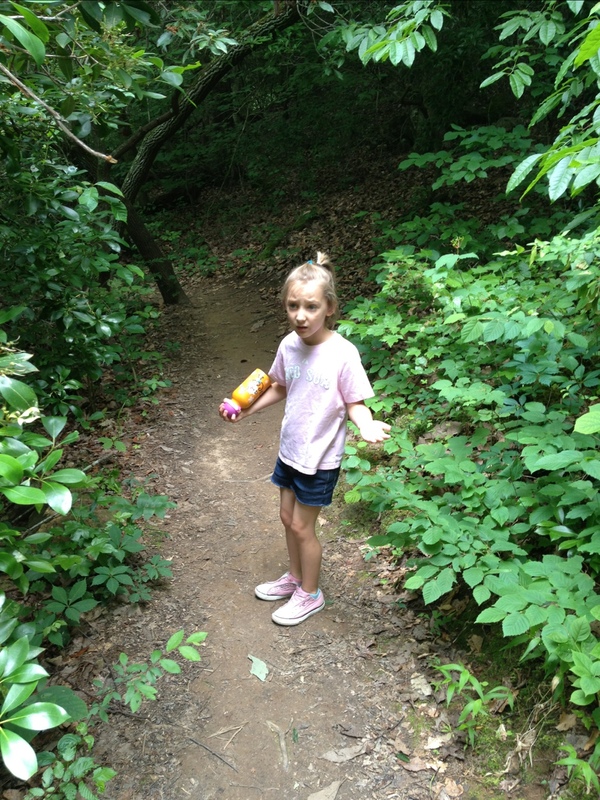 Ya know… before we hiked. When we used to nap. This entry was posted in Bad Mood, Exercise, Family, Parenting. Bookmark the permalink. It has been too crazy hot. 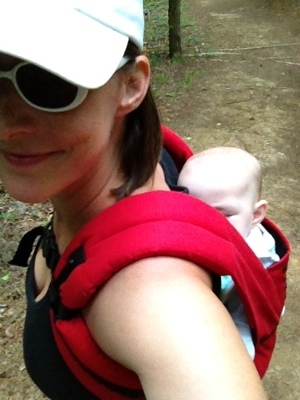 The need to carry the wee lass means I think we will resume the hiking in the fall. I can’t even walk in my back yard without my round ligaments acting up, much less a wagon-pulling around the block…4 miles?? I’m out of my mind!!! 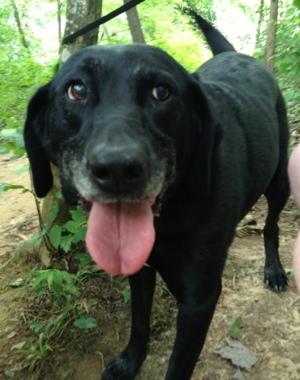 Last time we did a hike (uphill) Sammie complained after the first 500 feet. You’d think the Hollywood sign would have made her feel excited. Love the hike, love the post, love the pics. Coffee + Egg salad + runny bum + hike? YOU REBEL. Glad it was not disastrous! I know, I was playing with FIRE. I love it! I can’t believe Lucy slept the entire time! Oh my oh my. Know what I did yesterday? NOTHING. And I wasn’t even sick. You are a trooper. I mean hiker. So awesome. That pic of Em is cracking me up. You might be the craziest person I know for hiking after the trots. I mean….that is the most dangerous game. So glad you didn’t crap your pants! You and me both, mama. I am nothing if not a risk taker.